Russ Columbo, as pictured on the Eveready Book of Radio Stars, c. 1932. January 14 marks the anniversary of the birth of the great 1930s crooner Russ Columbo, born on that day in 1908, an icon in his day who had every girl swooning from coast-to-coast in the time after Rudy Vallée had past his apex of popularity, and before Bing Crosby reached his. Russ was born Ruggiero Eugenio di Rodolpho Colombo in Camden, New Jersey (home of the Victor Talking Machine Company). Thankfully, if only for the sake of fitting on record labels, he shortened his professional name to Russ Columbo. He took up violin as a child and made his professional debut not long after. In the late 1920s, Columbo played violin in Gus Arnheim’s Cocoanut Grove Orchestra, and can be seen in Arnheim’s 1928 Vitaphone short. 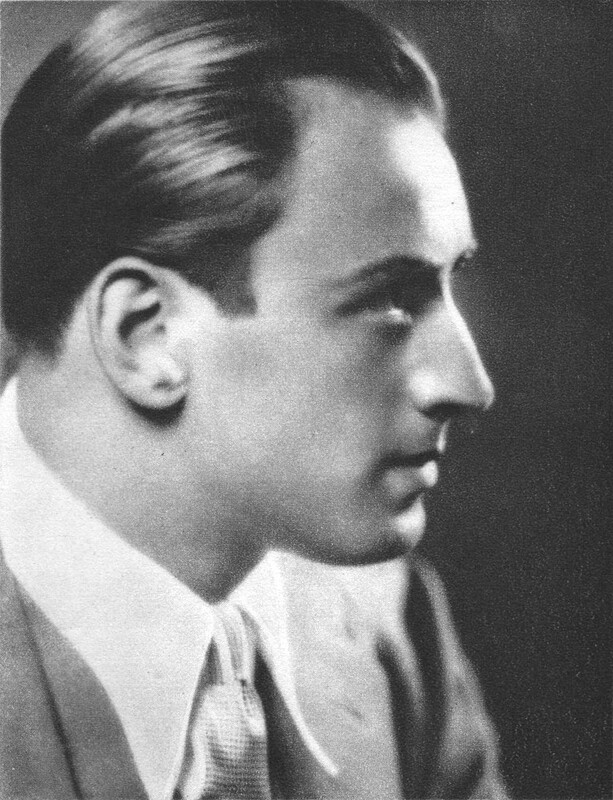 By the early 1930s, Russ had struck out on his own for a career as a crooner, introducing such hits as “You Call It Madness (But I Call It Love)” and “Prisoner of Love”. In the 1930s, he was romantically involved with Carole Lombard. Tragically, Columbo’s promising career was cut short at the young age of 26. On September 2, 1934, he was accidentally shot and killed when a musket belonging to his friend Lansing Brown’s gun collection misfired; the bullet ricocheted off a table, and hit him in the head. Victor 22802 was recorded on two separate sessions at Victor’s Studio 1 in New York City on September 3 and 9, 1931. Columbo’s vocal is backed by Nat Shilkret’s Victor Orchestra. I consider Columbo’s theme song, “You Call It Madness (But I Call It Love)”, to be one of the defining songs of the early 1930s style of romantic ballad, and a fine one at that, as well as one of the most evocative songs of the Great Depression era. 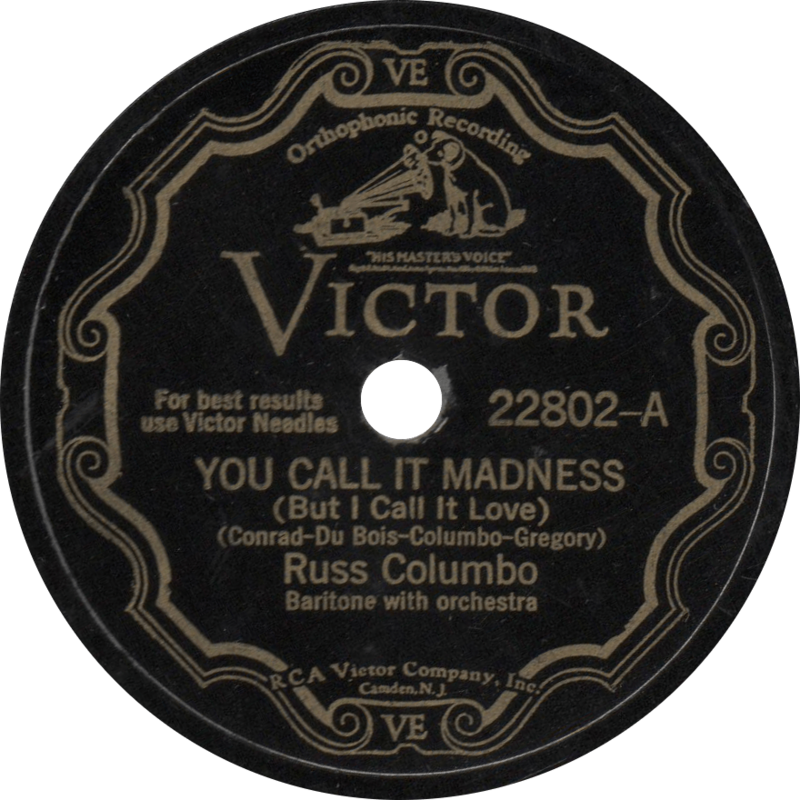 You Call It Madness (But I Call It Love), recorded September 3, 1931 by Russ Columbo. 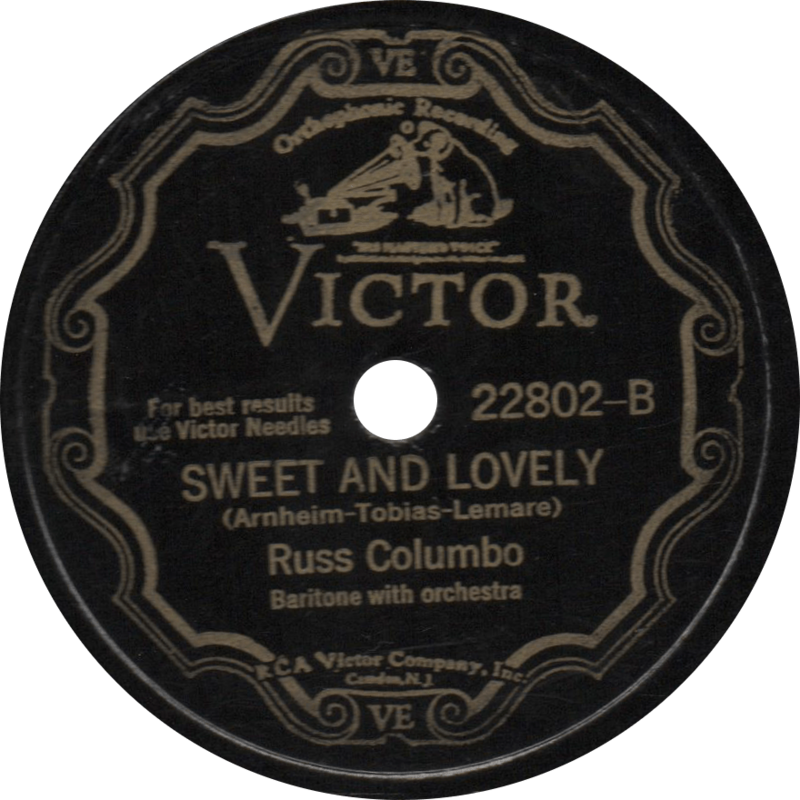 “Sweet and Lovely” was another of Russ Columbo’s top songs, and a well remembered standard. Sweet and Lovely, recorded September 9, 1931 by Russ Columbo. Updated on May 29, 2017, with improved audio. This entry was posted in Records and tagged 1930s, Gus Arnheim, New York, Popular, Russ Columbo, Sweet Music, Victor by R. Connor Montgomery. Bookmark the permalink. Absolute beautiful music takes me back to another place just amazing!!! !